So, you’ve heard all about the man cave but it’s high time that women had a woman cave as well. We need a space for us to retreat and relax once in awhile so that we can escape life for a little bit. 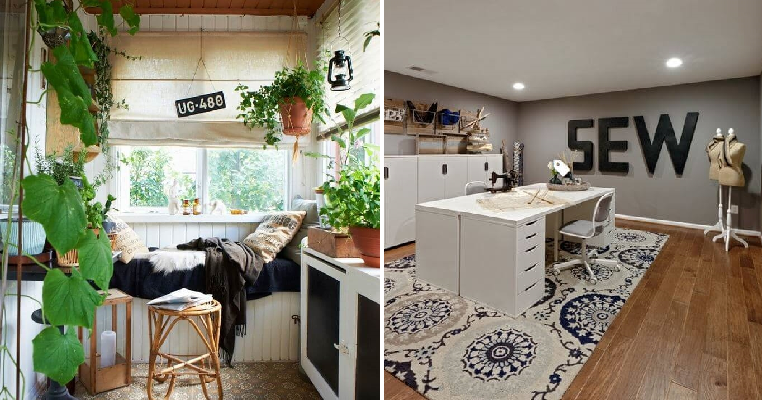 Here are a few awesome ideas for a woman cave that any female will love. A woman needs a space to relax and this luxurious woman cave is the perfect place to do so. It’s dressed up in a beautiful royal purple that looks gorgeous complemented with neutral colours to balance out the look. A reading nook is also a great idea for a woman cave as you can sit back and enjoy your books in comfort. Decorate it with a plush rug and fluffy pillows for a cosy place where you can hide away from the rest of the world. Sometimes you don’t need a big space for a woman cave as a little corner would be sufficient. This resting corner with a comfy bench and some fresh green plants next to a window allows the light to stream in and is the perfect hideaway. This is an easy idea for someone who wants a woman cave in their home that can be used for several functions when you don’t want to use it as your personal retreat. It’s decorated with some beautiful blue patterns and bright white colours which makes it super versatile. If you have the space for this then we say go for it! Get a cosy but comfy storage shed that is perfectly sized for everything you need and transform it into your personal woman cave with a few items such as a lovely sofa bed, overstuffed pillows and anything else you need. For those who love to dabble in arts and crafts then there is no better woman cave then a craft room that has all the materials they need. You can spend the free time you have in your woman cave doing the arts and crafts to create masterpieces.